April could not have gone much better for Colby Lewis, or his main promoter, Carson Cistulli. While other FanGrahps authors think his Cy Young chances range from 2% to skim, Carson continues to “pimp his dawg” (or whatever youthful slang Carson would use to describe his support). And for good reason: he sits just behind Brandon Morrow on the AL K/9 leaderboard with 10.47, and, although he has had some HR/FB luck, he still has a solid 3.60 xFIP. Compared to his previous time in the MLB, he is getting tons more swings outside the zone and swinging strikes — not surprising given his huge strikeout rate. This increase seems due, at least partially, to increased slider use. In his pre-NPB days he threw it 7% of the time, but through five starts this year he is throwing it a hair below 30% (according to the BIS classifications as well as my classifications of the pitchf/x data). By linear weights of the BIS classifications it is his nastiest pitch, already worth 5 runs above average, and I see it getting swinging strikes 20% of the time. The average slider last year got a swinging strike 13% of the time. Overall, Lewis is getting just under 12% swinging strikes compared to a league average of 8%. 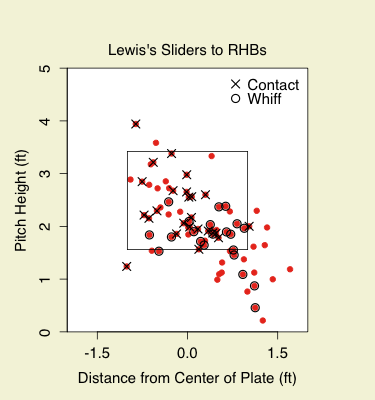 Lewis, like most RHPs, throws his slider more often to RHBs, 35% of the time compared to 25% fo the time to LHBs. Here are the locations of his sliders to RHBs, with contacted pitches and whiff pitches marked. Unlabeled pitches were taken. When Lewis leaves his slider up-and-in it has not been missed, but when they are down-and-away he gets tons of swinging strikes. This is a common pattern with sliders, and Lewis has done a pretty good job of keeping his down-and-away. Patrick Newman, also a FanGraphs author, has a great pitchf/x-like tool for the NPB and with it we can go back and look at Lewis’s starts there. You can find it here, choose any date and see his pitch type and velocity over the course of a game. A cursory look through this shows a healthy dose of sliders, so it seems to me that this increased use of sliders was something that he started in Japan. So far it has worked wonders for him back in MLB. We hoped you liked reading Colby Lewis’s Sliders by Dave Allen! This has nothing to do with this article, so I apologize in advance. However, I have to know, does the runs created stat on this site include stolen bases? If so, then could someone give an overview of what goes into that stat? Yeah Runs Created does include stolen bases, but that is the only base running it includes. Here is an explantation.